Hey gang! Today, I have 11 runs and 2 big dailies to go over. Let's jump right in. bootsthatshoot has been hard at work getting all the bonus points available for completing the challenge runs. He finished a 17:37 No Gold Hell run this time! All that he has left is Max Low% and Low% Hell. He has been to Yama this week on Low% Hell and is trying the run quite a bit, so I am confident he will get it! Low% Hell is a big milestone run for a Spelunky runner and Boots definitely deserves it :) Boots is strengthening his position in the overall top 20, currently ranked 19th! Patdog56 finished an awesome Max Any% run, a 4:51. Check out the Olmec fight! The last stomp in combination with Pat's teleport actually moves the teleporter out of his hands for a moment! It is really neat to watch. Pat also submitted a sub 10 Max Hell run! He got a 9:05. I've watched a lot of improvements in Pat's platforming and play in general over the last few months and he's earned himself a spot in the top 20 of the main ranking, right up there with Boots. Patdog and Boots are both really close, with Boots having an edge in main speedruns right now, but Patdog having a ~600k lead in score with a well-done daily. Patdog is currently 1 spot ahead of Boots on the ranking, but with how close Boots is to Low% Hell, that could change at any moment! Great job this week, Pat and Boots! I (Kinnijup) got a new score run WR. I got a $3,449,650 run. Linkruler is doing a write-up on it so I'll let him go over that one - thanks Link! MikeIsMyIke improved his All Journal Entries run, almost breaking the 1 hr mark. He got a 66:01 run. Keep it up, Mike! Another guy working on some RTA runs this week is Grooomp. He submitted an 82:01 All Journal Entries run and a 21:18 All Shortcuts + Olmec run. I don't know much yet about AJE runs, but the AS+O run Grooomp did is already looking good. It is ranked 11th (just missed the top 10) in a category that gets a lot of attention across the globe :) Grooomp has also been hitting some WR quality splits in Any%, and lost a sub 2 run a teleport away from the 4-3 exit. This guy has come so close to several killer runs, and I hope he is not getting discouarged at all by the RNG element. Regardless of not finishing a few of his best runs, he still has some killer PBs and sits at 16th on the overall ranking. The last guy this week working on some RTA stuff is ShinGraywords. He managed a 106:28 All Journal Entries run. Thanks for streaming these Shin, they are fun to watch, especially now that we have Sasha's autosplitter! denis1080 submitted a Max Any% run - a 16:26. Always great to see the max categories getting some attention! Community veteran grozger submitted a no-jp Hell PB. He got an 11:34. Nice run, Groz! Finally, we had 2 massive dailies done on yesterdays daily challenge. Krille got a $3.00mil while SpelunkyGod got $2.98mil. SpelunkyGod opted to go to the castle, which resulted in a slightly less profitable level but a guaranteed HH. Both of these guys did something insane on this daily, they took a 5-2 altar to ghost yama. 5-3 was not easy on that seed, either. Krille is in a good position to reach the $3mil daily average that only d_tea currently has, and SG is not far behind. SG also managed to pass twigglefly for a spot in the daily average top 5! Great job, guys. All in all, a very good few days for these runners! Hell was thought to be the hardest record to break, but it has now been done. On 18th of April, Kinnijup achieved the hell% world record with the time of 3:42.571. Previous record was 3:44.411 by D_Tea, making it an improvement of less than two seconds. There are currently four sub four hell runs ever to be done, the other two are 3:52.048 by SpelunkyGod and 3:52.999 by Pibonacci. It all started with a generous shop on 1-2, providing everything necessary for early game. Climbing gloves are only in the way on teleporter runs, but Kinnijup did a good job avoiding it. Black market was spotted on 2-2 from the leaves surrounding the entrance. The second shop in the black market contained the needed bombs, so resources were set for the rest of the seed. He decided to bomb the shopkeepers in the ankh pit instead of teleporting down to pick up the ankh; the additional risk would not be worth it for saving a second. A time of 1:04 into ice caves is just amazing. Temple started a bit scary with Anubis next to the exit, the shopkeeper and three tiki traps. It got even worse when a pushblock fell down from the roof after killing Anubis, nearly crushing the scepter on its way down. With his deep knowledge of the games mechanics, he managed to grab the scepter that fell down between two tiki traps and dodge all the purple bubbles from Anubis simultaneously, without it costing him any more time. The next scary part of the run was in City of Gold, when a golden thwomp came pixels from crushing him, though two tiles seemed to be enough room to avoid it. The hell door entrance on Olmec was in a really great spot. Not needing to reposition him after killing Anubis 2 saved a lot of time and made the fight only last 34 seconds. After Olmec, the first hell level nearly ended the whole run. A blue devil stunned him, and would have stunlocked him if it was not for a well-timed whip. Bad spawns on Yama in conjunction with being down to only one health point required some good improvisation, but he were determined to finish this seed and took home the hell world record! Congrats to Kinnijup for another world record, with one of the craziest speedruns in this game! Hey gang! Got about a dozen runs to go over today. Here we go! grozger submitted 2 runs this time around. He nailed a nice sub 4 Low% run (Any% too!). He got a 3:53. His other PB was a nice $569k score PB. denis1080 was the most active member this update, submitting 3 runs that counted for 4 categories. He got a 26:27 Hell run, a $477k score PB, and a 45:47 All Shortcuts + Olmec run. Way to go, Denis! Another guy quickly progressing is Polodajaneiro. Polo submitted a 12:40 Hell run, and a4:01 Low% (also Any%). Getting close to sub 4! Yesterday, we saw an awesome Low% Hell PB from BumCommando! He was actually WR pace into Yama, but bad enemy RNG and the exit being on the 2nd side cost him some time. He still hit a crazy solid 5:51!!! This is 97.5% of the WR and gave Bum a lot of points. He has almost reached curticus2. Great job with the podium position Low Hell PB (3rd place), Bum. Lastly, we have a lot of high scores hit on some dailies recently. I (Kinnijup) got a $2.97milrun, SpelunkyGod got a $2.53mil run, and Sedoxa hit his best daily ever. He nailed a$2.47mil run! Hey gang! Another good week for Spelunky runners, with 15 runs in total! Let's go! denis1080 submitted a new Any% PB, a 12:45. Getting near sub 10! He also got a score PB on a daily, a 326k run. MikeIsMyIke got two PBs this week, a 6:00 Max Any% run and a 75:44 All Journal Entries run. Speaking of AJE, saturnin55 got one of these too, less than 1 minute behind Mike! Maybe we can see some competition between the two here? Saturnin's time was a 76:37. Good job, guys! This category requires a lot of dedication. Saibot took a teleporter-less jetpack seed and finished a 3:09 Any% PB. Great job, Sai. I'm sure you can get a sub 3 on the next one! I'd like to see some other people go for this - an Any% PB / sub 3 without teleporter. You can go for years without finishing a teleporter run due to its random nature, so I feel PBs like this one (JP runs with no TP + with or without mattock and/or compass) deserve a lot of credit too! Another run Saibot finished was a 29:50 No Gold Hell run. Great job, Sai. I know you really wanted that one, so congrats on finishing this difficult challenge run. Polodajaneiro got a daily score PB, a 287k run. Nice to see you going for some score runs, Polo! Next up we have an old member of the community who just got around to adding some runs to the moss sites - grozger. He submitted a 4:16 Low% (also his Any% PB) and a 15:36 Hell run. Nice to have you, groz! I (Kinnijup) got the hell record this week, a 3:42. Feels kind of weird to write about my own runs so I'll leave it at that haha. Lastly, Bootsthatshoot joined the eggplant.club! CONGRATS maaaaaaan! No one's first eggplant is a speedrun, but an insane accomplishment regardless. He got a 32:20. Hey hey gang. Another good week for Spelunky runners, let's get started! NightHarvester partially closed the gap to #16 on the ranking with All Shortcuts PBs. He got a 21:00 key split and a 23:07 Olmec finish. The Olmec finish is nearly a 4 minute PB! Saibot is working on finishing a no gold hell run. While he does that though, he is also doing some dailies. He managed a 662k one so far, which is his score PB. Good luck, Sai. MikeIsMyIke submitted two runs for this update, a 19:30 key split for All Shortcuts and a nice 1.6mil score run. He improved very quickly with his score running and I am excited to see what he can do in the future. Keep it up, Mike! That's all for now. Keep'em comin'! Kinnijup Achieved the Any% World Record! Speedruns in Spelunky are continuously getting shorter. On 13th of April, Kinnijup achieved the Any% world record with the time of 1:39.716, improving the record with a bit more than 400 milliseconds. Previous record was 1:40.145 by D_Tea, uploaded to youtube exactly 40 days earlier. Any% has seen some quick improvements, since SpelunkyGod's record of 1:41.499 eight months ago. Being the first to ever finish a run below 1:40 is an awesome feat. With a shop at the start of 1-2 containing all the necessary equipment after a good enough first level, he was on a great start. The following levels were all well balanced, some straight down, and some diagonal. They had in common that they all were finished quickly, thanks to his skill with the teleporter. The Olmec fight was nearly perfectly done, with the first bomb exploding merely some tenths of a second after Olmec stomped down, resulting in a 28 seconds long fight. If the first bomb explodes before Olmec gets the chance to stomp down, one less layer will be destroyed, resulting in a longer fight. The end of the run had some really tight moments. The whole 4-3 was filled with enemies and traps, requiring quick reactions and level reading. Both the arrow from the arrow trap and the bullets from the shopkeeper came within pixels of killing the run. Olmec was equally scary when a blue frog spawned on his side, forcing Kinnijup to teleport upwards early. With each consecutive world record, we are approaching the limit of the in game timer, a time of 1:30.000. The game has several built in methods to prevent cheaters, some of which are the hardcoded lines for the timer and the score tracker. Finishing a run below 1:30.000 will just result in a time of 99:00.000 on the leaderboards. A high score of $3 000 000 was also seen as cheating before the community proved that a score that high was possible. Not long after, BananasaurusRex achieved his $3 105 850 score run from a plasma canon in a crate on 1-1. Congrats to Kinnijup for finishing the first ever run in under 1:40 and securing the any% world record! So many runs! WRs, Big Money and Hell% galore! Hey spelunkers, another batch to go over! First, we have denis1080 that submitted his second run, this time a first time completion on All Shortcuts + Olmec. Keep going! Veteran BumCommando has been grinding All Journal Entries quite a bit lately and finally got the WR with a very nice 40:09. He unlocked the 114 journal entries while going over only 7 seeds! We just started keeping track of this category on Mossranking and our friend AlphaChannel released a very nice Journal Tracker which makes running this category so much smoother. I expect some activity on this category, which can be a nice change of pace from the way we usually play Spelunky. STAR League runner Kvec finished a speedlunky Hell% run with a sweet 7:46. Nice! SAIBOT removed another 20k penalty from his total points by finishing a 20:31 Big Money and a 22:36 Max Hell. He is very active and working hard on removing penalties. He is also very close to nailing runs in very hard categories. I think we'll hear a lot more from him! A must follow on twitch! One of the current most impressive rise on the ranking leaderboard is Sedoxa which is sitting in 13rd place. 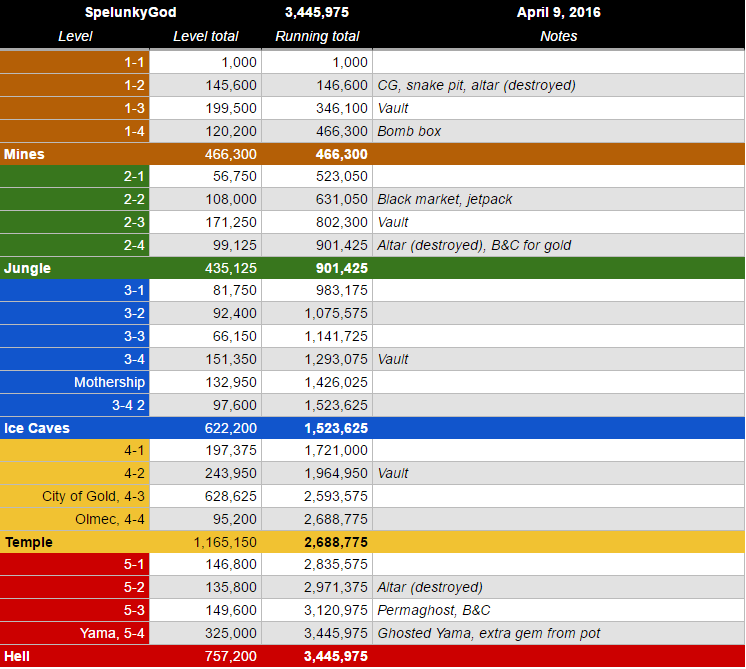 He finished a breathtaking 12:46 Big Money where he got in touch with 3 shopkeepers He also nailed an impressive win on the April 11th Daily with a $1,852,650 score, leaving him with only the 2.5M requirement to get the subreddit champion flair! With that run, his daily average his now above the $1M mark! Awesome plays Sedoxa! gjchangmu finished a 17:46 Hell% run. He is often streaming on twitch, give him some love on his channel. My friend bootsthatshoot is on fire. He completed a very impressive 5:49 Hell% run and an unorthodox 13:26 Olmec finish Big Money run! He his now sitting with more than 350K points, racking up points along with a few runners that are exchanging positions back and forth in the 18-24 positions. MikeIsMyIke keeps going and submitted a quite nice 7:20 speedlunky Hell% run. That’s the 4th Hell% run of this batch! Keep it up Mike! Spelunker Nightharvester has been very active lately. Finishing a 25:43 No Gold Hell and a 25:59 Max Big Money jetpack-less run! He only needs a Low% Hell to get rid of his last 10K penalty. I wouldn’t be surprised to see him rise above the 600K points mark in a near future. Lastly, we have SpelunkyGod’s Score world record. Krille went over his amazing run in an in-depth analysis that you can read here. This Saturday, a new world record was broken in Spelunky. SpelunkyGod achieved a High Score of $3 445 975, breaking the previous record of $3 404 400 by Kinnijup which stood for half a year. An improvement of $40 000 may not seem like much, but with High Score being such an optimized category it is huge. The seed started out with low mobility, only climbing gloves and a cape in 1-2. He still managed to successfully maneuver the ghost around the level over every single gem. The resources were plentiful throughout the seed, with several mattocks and a crazy amount of bombs. 72 bombs and a mattock in the 2-2 black market was really generous, made it possible to mine most gold chunks in the jungle. The Jungle was the only weak part of the run. The rest of the areas were all above average, with the Ice Caves being craziest of them all. He managed to gain $81 000 to the previous record in Ice Caves alone, which already had good Ice Caves. The temple was also good, even though there was no chance to ghost Olmec, with the lack of altars on 4-1 and 4-2, which would have significantly increased the score. The splits can be seen here. The most nerve wracking part of the run was 5-3, when he brought perma ghost and the Ball & Chain from the 5-2 altar to ghost Yama. The level started in a tight corner, with the ghost quickly appearing from the right side. Several spikes, a blue devil and four spike balls nearly ended the run there, but quick thinking and precise movement saved him. All of this was done without having the Kapala, making every danger a possible threat for the run. Past the Moai Head, the health situation stayed on 6 hearts for the majority of the remaining levels, a feat on its own. All in all, SpelunkyGod did a great job finishing this challenging seed and securing the High Score world record! Hey there. We have 15 runs to go over this time! Grooomp hit a nice score PB - 1.58 mil. It is looking more and more like he will get the coveted 3 million run. Good luck, Grooomp! He also hit a nice Hell PB, a 5:43. Lastly, he got a 10:01 Max Hell PB. Getting some solid PBs lately, Grooomp. Keep at it! denis1080 joins the ranking with a 17:08 Any% run. Nice to have you, denis! Linkruler nailed a solid Big Money run, a nice sub 9. He hit an 8:55. Great job, man. Saibot got a score PB on a daily. He managed a 658k run. Keep it up, Sai! NightHarvester has been extremely active lately, and it's great to see. For this update, he submitted a pair of All Shortcuts times. He got a 21:31 Key delivery split and a 26:43 Olmec finish. Getting close to 25 minutes here. I (Kinnijup) had a pretty good couple days. I got a 3:47 Max Low%, a 6:07 Big Money WR, and a 4:15 Haunted Max Low% record. saturnin55 finished his last remaining challenge run of the 15 Mosstier categories - an 18:04 Big Money run with a late cape. Nice job getting to 0 penalties, sat! Lastly, we had a big daily happen. 3 people finished with a 2.9mil+ run, which only ever happened once before that I know of (I probably just didn't notice it in the past though). d_tea edged me out to get the highest score on it, a 3.168mil. I got a 3.159mil, and twigglefly got a 2.936mil. twiggle's score was a bit lower because he did a slightly different strat (bombed temple and CoG instead of using ball and chain) but still impressive nonetheless, and his 2nd highest daily! This daily pushed him ahead of Kenneth for a top 5 position in daily average. Congrats, twiggle! You can see the leaderboard for this daily here. Of note also is this pushed d_tea's daily average above 3.05 million! Way to go, tea! The 4th of March, d_tea achieved the world record in any% with the insane time of 1:40.145, beating SpelunkyGod’s time of 1:41.499 by a bit more than one second. He now holds the record in every speedrun category, being the 4th ever to do so (pibonacci, latedog and bananasaurus_rex being the other 3). 1-1 teleporter in a crate into a teleporter/jetpack/compass shop in 1-4 made this possible, though the seed only got faster from that point. A mixture of great skill and a seed that worked out made him able to finish this one and take home the world record! There have been several daily challenges who have been generous with the score this month. The best one were the 20th of March, which was insanely hard to finish. The normal strategy is to save a hired help who can hold the plasma canon into 4-2, making it possible to use it in City of Gold. It was not the case here, instead heavy use of the Ball & Chain was needed to achieve the highest scores. The Ball & Chain was used from the 2-3 altar into 3-4, from 4-1 to Olmec and from 5-2 into Yama. All these early altars made the seed harder, but they allowed to ghost all bosses, significantly increasing the score. Sadly no top-runners finished the daily, with d_tea being the closest dying on 5-2 with a score of $2 847 550, while still having some of 5-2 left. If 5-3 were $140 000, it would have broken $3 300 000 and possibly achieving the place of the world’s highest daily, currently sitting on $3 301 250 by krille71 from last December. The creator of Spelunky, Derek Yu, wrote a book about Spelunky that came out 29th of March. The book is about how he made Spelunky, design decisions and what inspired him. The book with the title Spelunky is $14.95 for a Paperback copy and $4.95 as an ebook. You can see a review of the book here. The key to cascading may have been found, with the upgrade to windows 10. Cascading, for those who don’t know what it is, is when you place several paste bombs in one spot, where the bombs falls down the hole the first bomb made, quickly making a perfect hole. It is possible to do on all consoles, but it is glitched on a minority of the PC users, which has caused a lot of problems. A newly found strategy made the Olmec fight way faster and safer, on both any% runs and hell runs, from the use of cascading. It is therefore important that we may have found a setup that works for everyone, but further testing needs to be done before we can say for sure that windows 10 fixes the problem. Help us find out by answering this survey. The new Olmec strategy utilizes max ranged bomb cascading. With the help of 6 sticky bombs, it is possible to make a hole for Olmec all the way to the lava, killing him really quickly. The strategy even exceeds the old TAS strategy, used in Bum's Tool Assisted Speedrun. The charm with max ranged bomb cascading is that it is even more usefull on hell runs, possibly saving more than 10 seconds on some seeds. Three new records have been set in challenge runs, all three in the maximum categories! The first record was maximum any% in 2:10.289 by SpelunkyGod, improving his record by close to 10 seconds. The second one was maximum hell in 4:27.592 by Kinnijup, this time with an improvement of 12 seconds over his last record in the category. Lastly, SpelunkyGod took home the record in maximum low% with the insane time of 3:28.416, an improvement close to 30 seconds! That was the highlights of March, looking forward to another active month in the Spelunky community!